Vakdevi is the Hindu Goddess of speech, sound, language and learning and finds reference in the Rig Veda. She is what all living beings utter. 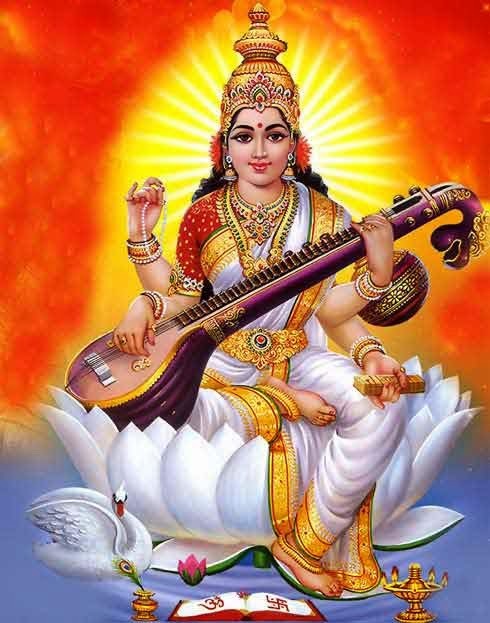 The Puranas and post Vedic literature associated with Hinduism equate Vakdevi with Goddess Saraswati. Vakdevi cannot be easily pleased. One can get her blessings only through hard work. But her blessings will never be taken back. Once She blesses it remains with the living being forever. Here Vakdevi differs from Goddess Lakshmi, the goddess of prosperity. The blessing of wealth that is showered by Goddess Lakshmi can be taken away at anytime. But the blessing of knowledge showered by Goddess Vakdevi remains life long. It must be noted that in Puranas, Goddess Vakdevi is identified with Goddess Saraswati. It is believed that earlier, Vakdevi used to stand by the side of Bhagvan Vishnu. For example, the Lord Jagannath is flanked by Goddess Lakshmi and Goddess Vakdevi. But later on Vakdevi did not find a place. It is now believed that Vakdevi hides in Vishnu’s tongue. Some local folklore suggest that Goddess Lakshmi and Goddess Vakdevi were constantly fighting as to who is superior. Fed up with their quarrel, Vishnu decided to do away with one. Symbolically, the folklore suggests modern man’s inclination towards wealth. To attain wealth many people ignore true knowledge.